Does anyone really know the difference between a muffin and a cupcakes? My favorite part of either is the frosting so... when I read this week's Tuesdays with Dorie recipe (Carrot Muffins) I knew I would have to include the cream cheese frosting. I was out of coconut (bleh!) so I added a little oatmeal instead. 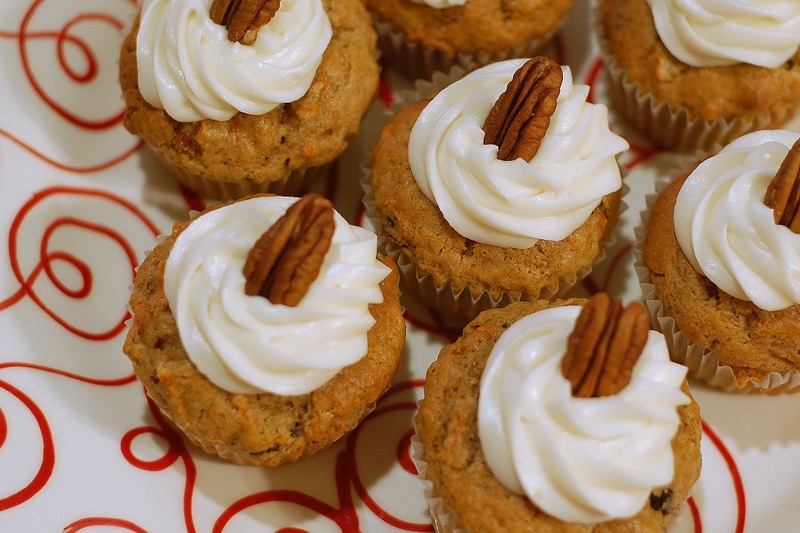 With the spices, pecans, Craisins, and frosting- these were the best carrot cupcakes muffins I've ever made. They came out with the perfect rise (flat muffins kind of bother me!) and took only a couple minutes to whip together. Don't forget to use paper liners to remove the muffins easily and to set the muffin tin on top of a cookie sheet to keep bottoms from burning (no one likes that!) You could easily sub in half whole wheat flour and no one would be the wiser- then you might not feel as guilty topping your muffins with cream cheese frosting! See the recipe at Nancy's awesome blog here or buy the book on Amazon. They look so cute with the frosting and wlanut on top! I was going to frost mine but they got eaten too quickly. Company couldn't resist, neither could I. They look beautiful frosted. I must make another batch soon! You've made them look so pretty! Delicious. Wow they look so pretty and SO yummy! I wanted to frost mine too and plan to when I make them again! You win the prize for most elegant-looking muffins! Mmm, cream cheese frosting...delicious. Those look great with frosting! They were good plain, too. oh, frosting! it makes a muffin so much more appealing! I'm going to hazard a guess that the frosting puts these over the line to cupcake territory, but either way they look amazing the way you've finished them. And I know they tasted great as well! Thanks for baking with me this week. These are adorable! I love all of the flavors here -- they remind me of Autumn! I want to try these out for myself, yummy! Just a little on top with the pecan = Perfect!! This is exactly what I wanted to do with my muffins too Anne! I just knew if I did I wouldn't have the willpower I needed to keep them in the house :) They look gorgeous! Love your work on blog and the muffins look amazing! And I wanted to personally invite you to be one of the first cooking Advisors on ShopSquad (http://www.shopsquad.com/?vsrc=FDs), a free shopping advice website where shoppers and your readers can ask Advisors (i.e. you!) for advice. If you recommend kitchen tools, cookware, or appliances that are purchased, you get a percentage of the sale. You're already sharing your expertise through your blog, so why not earn more money for it? You can also earn $5 for each of your readers who signs up (http://www.shopsquad.com/shoptags/?vsrc=FDs). Read our great press coverage (http://www.shopsquad.com/about/?vsrc=FDs) or learn how ShopSquad works (http://www.shopsquad.com/howitworks/?vsrc=FDs). When you're ready, sign up free at www.shopsquad.com.